Saturday’s stage featured six categorised climbs and more than 4,000m of ascending in a 97.5km race. Yates was content to sit in the peloton in the early stages as a group of 15 riders broke clear, with Thomas de Gendt the chief aggressor as he picked up points in his successful quest to win the King of the Mountains jersey. The first significant attacks came on the second ascent of the Coll de Beixalis with Miguel Angel Lopez, who started the day more than two minutes behind Yates, jumping clear. However, Yates, who was being superbly paced by twin brother and team-mate Adam, refused to chase, preferring to climb at a more steady rate and all the favourites reached the summit together. Nairo Quintana, the 2016 Vuelta champion, attacked on the descent and was joined by Lopez on the subsequent ascent of Coll de la Comella. 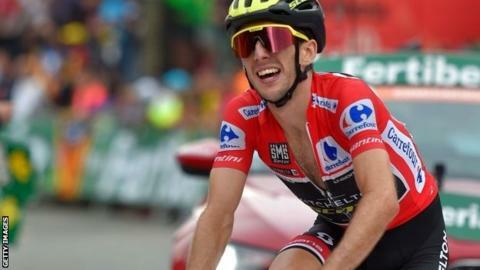 However, the Colombians were unable to build a decisive lead and when Simon Yates attacked with 17km remaining, he was able to also drag Mas over to make a leading quartet. When asked why he attacked at that stage, Yates said his brother “was running out of legs”. He added: “I knew that Lopez and Quintana were up the road, and Lopez especially had something to gain, so I knew he’d maybe work with me. Alejandro Valverde, who won this race in 2009 and was second going into Saturday’s stage, was unable to keep pace and ultimately lost his place on the podium, dropping to fifth overall. Quintana dropped back to try to pace Movistar team-mate Valverde, leaving Yates, Mas and Lopez at the front. While 23-year-old Mas and Lopez realised the need to push on in an effort to secure a podium spot, Yates seemed content to let them go and ride his own tempo to the finish. He crossed the finish line 23 seconds back after Mas beat Lopez to the line and also to second place overall. After a solid opening time trial, so often his Achilles heel in stage races, Yates showed his intent on stage four – the first mountain stage. He had lost a few seconds on stage two but got them back and more by finishing eighth at the top of the Puerto de Alfacar to climb up to third overall. He took control of the red jersey in rather fortuitous fashion on stage nine. 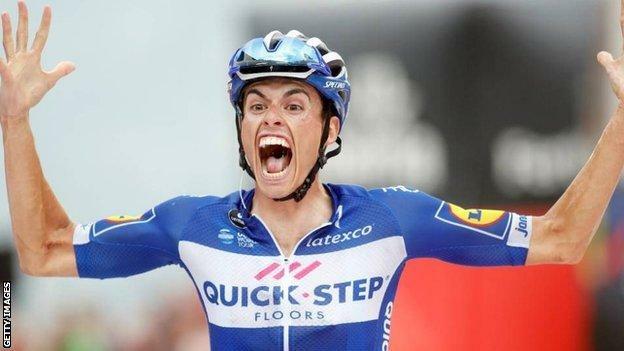 He had slipped 14 seconds behind Valverde after the 38-year-old Spaniard won stage eight. But Yates finished ninth on a day when Ben King won out of the breakaway to move ahead of Valverde by one second and take the lead. The jersey was lost on stage 12 in what appeared to be a planned move with Yates saying his Mitchelton-Scott team “decided not to really chase anyone”. He reclaimed it with victory on the climb of La Camperona on stage 14. Though the margin was only a couple of seconds, with bonuses applied he opened up a lead of 20 seconds over Valverde and 25 on the Spaniard’s Movistar team-mate Quintana. And he cemented his place at the top of the standings with another assured ride on Saturday’s final mountain stage.